Downtown is safer after law enforcement action, but outlying neighborhoods are now bearing the brunt of illegal campers. (Al Hartmann | The Salt Lake Tribune) After Operation Rio Grande, homeless camps have popped up everywhere. Some of the homeless have set up camps in the thick vegetation near the Jordan River south of 3900 South and 900 West, just 50 yards off the Jordan River Parkway Trail. Camps are full of garbage, tarps, coolers and sleeping bags. Disposal of human waste at the camps is a health problem. (Al Hartmann | The Salt Lake Tribune) After Operation Rio Grande, homeless camps have popped up everywhere. Some of the homeless have set up camps in the thick vegetation near the Jordan River south of 3900 South and 900 West, just 50 yards off the Jordan River Parkway Trail. Camps are full of garbage, tarps, coolers and sleeping bags. Disposal of human waste at the camps is a health problem. (Al Hartmann | The Salt Lake Tribune) After Operation Rio Grande, homeless camps have popped up everywhere. Some of the homeless have set up camps in the thick vegetation near the Jordan River south of 3900 S. and 900 W. just 50 yards off the Jordan River Parkway Trail. Camps are full of garbage, tarps, coolers and sleeping bags. Disposal of human waste at the camps is a health problem. (Al Hartmann | The Salt Lake Tribune) After Operation Rio Grande, homeless camps have popped up everywhere. 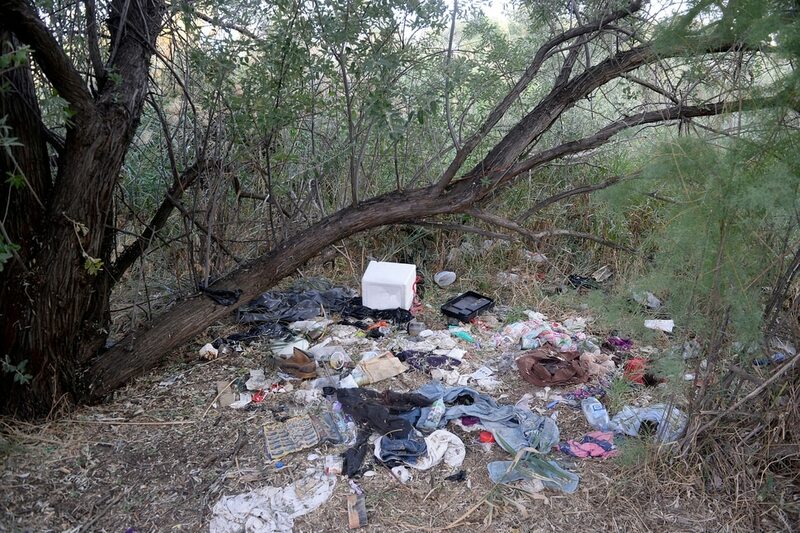 Some of the homeless have set up camps in the thick vegetation near the Jordan River south of 3900 South and 900 West. 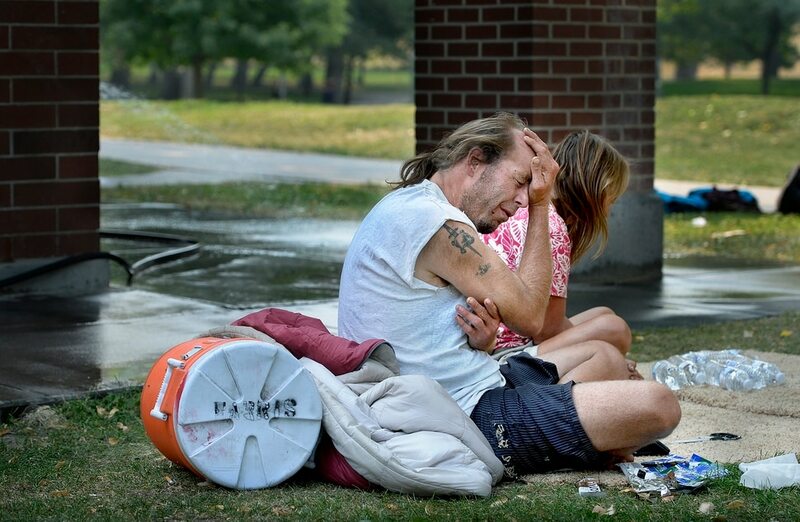 Police are responding to frantic calls from residents who report homeless transients in nearby parks, alleyways and backyards — a reaction to the law enforcement initiative aimed at clamping down on crime around The Road Home shelter in downtown Salt Lake City. Since the Aug. 14 onset of Operation Rio Grande, campers have scattered throughout Salt Lake City and beyond, looking for safe haven even though camping within city limits is illegal. Rio Grande Street, Pioneer Park and 500 West are now much safer than they were before the law enforcement action, when the area was characterized as a lawless and sometimes violent open-air drug market, complete with discarded needles, garbage and human waste. 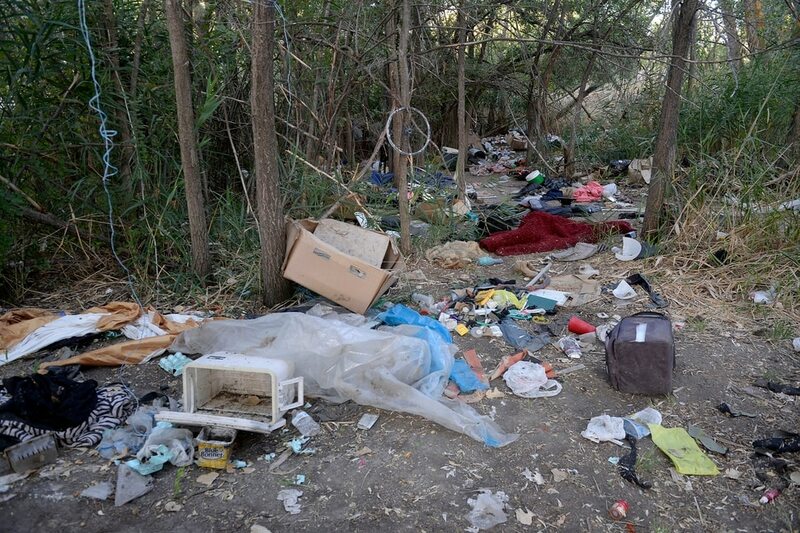 But the outcome of the operation also includes a marked increase in homeless campers in many neighborhoods, along the Jordan River and the foothills north of downtown. The city’s west side, for example, has been significantly impacted by the homeless dispersion, said Dennis Faris, chairman of the Poplar Grove Community Council. In Central City, Michael Iverson said he’s seeing a significant increase in homeless campers. Police and the Utah Highway Patrol are responding quickly to complaints. In an Aug. 29 Salt Lake City Council work session, Utah House Speaker Greg Hughes, R-Draper, said that he and others spearheading Operation Rio Grande knew such scattering would take place after the crackdown. But as police push campers from one place to another, tensions have ratcheted up among those homeless people, leading in some cases to threats against city park employees. In an Aug. 8 email, Lorna Vogt, deputy director of operations for Salt Lake City’s Department of Public Services, warned that there would be “costs and consequences” of pushing people into parks, foothills and other open spaces. Although homelessness is not illegal, camping in Salt Lake City and other municipalities in the county is against the law. Simply asking campers to move along isn’t the solution, Hughes said. Those alternatives have yet to be formulated. Councilwoman Erin Mendenhall asked Hughes during the work session how officials will deal with heroin addicts and traffickers who have now receded into the shadows of parks and neighborhoods. He was short on specifics, but Hughes did say that law enforcement will make it so difficult to sell drugs here that traffickers will eventually move elsewhere. “I want Utah to be a place that is the worst place to sell drugs,” he said. Homeless people have been hanging out in the Sugar House area in relatively small numbers for years. But there is an influx of people there, too. A homeless man who identified himself only as Jeff said he’s noticed an upswing in homeless people around Fairmont Park. Jeff, and others like him, keep moving until they have to sleep. Daniel White, 48, and Angela Nuhl, 37, relocated to the Fairmont Park area from Rio Grande Street three months ago, when things there became too dicey for them. Outreach workers from Volunteers of America (VOA) Utah say they, too, are witnessing more homeless people in neighborhoods and outlying areas. VOA outreach teams bring water, clothing and sleeping bags to homeless campers and try to steer them to service providers, including detox and mental health facilities. People who have moved away from the Rio Grande district don’t know where to access everyday needs, like food and water, said VOA outreach worker Machele Nieto. Beyond that, regular clients have moved, apparently in reaction to a greater police presence throughout the city and county. (Scott Sommerdorf | The Salt Lake Tribune) Sean Spalding, of the Volunteers of America, hands out some supplies to homeless men in Fairmont Park, Wednesday, September 6, 2017. (Scott Sommerdorf | The Salt Lake Tribune) Homeless couple Daniel White and Angela Nuhl sit together in Fairmont Park after getting some bottled water from Volunteers of America workers who were in the park checking on campers, Wednesday, September 6, 2017. (Scott Sommerdorf | The Salt Lake Tribune) A man lays alone on the grass in Fairmont Park, Wednesday, September 6, 2017. (Scott Sommerdorf | The Salt Lake Tribune) Sean Spalding, of the Volunteers of America, drives through Sugarhouse Park looking for homeless people to see if they were in need of some help, Wednesday, September 6, 2017. (Scott Sommerdorf | The Salt Lake Tribune) Machele Nieto, left, and Sean Spalding, of the Volunteers of America, hands out some supplies to a homeless man in Fairmont Park, Wednesday, September 6, 2017. (Scott Sommerdorf | The Salt Lake Tribune) Machele Nieto, left, followed by Sean Spalding, of the Volunteers of America, hike over to a group of homeless people in Fairmont Park to see if they are in need of water, food, or other supplies, Wednesday, September 6, 2017. 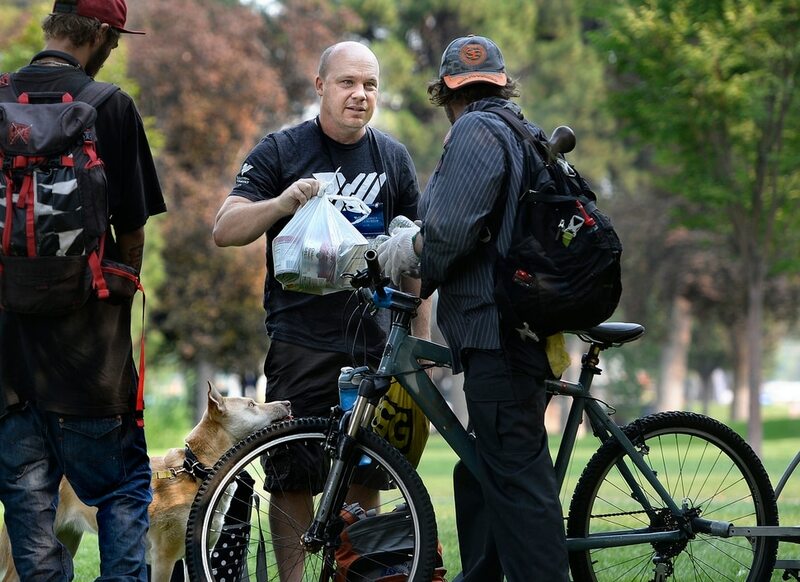 (Scott Sommerdorf | The Salt Lake Tribune) Sean Spalding, of the Volunteers of America, hands out some supplies to homeless men in Fairmont Park, Wednesday, September 6, 2017. (Scott Sommerdorf | The Salt Lake Tribune) Machele Nieto of the Volunteers of America, hands out some supplies to a homeless man in Fairmont Park, Wednesday, September 6, 2017. (Scott Sommerdorf | The Salt Lake Tribune) Volunteers of America / Utah CEO Kathy Bray looks out over Sugarhouse Park as her team was looking for homeless people who may have been in need of help, Wednesday, September 6, 2017. (Scott Sommerdorf | The Salt Lake Tribune) Machele Nieto, of the Volunteers of America, hands out water and some supplies to a homeless man in Fairmont Park, Wednesday, September 6, 2017. Not least among the issues of a dispersed homeless population is garbage and human waste. While campers in parks have access to restrooms and garbage cans, others who seek shelter along the Jordan River or the foothills don’t have those amenities. That makes for a potential public health hazard, said Jorge Martinez, the community outreach and cleanup coordinator for Salt Lake County. Groups of homeless campers along the river and in the foothills are up significantly since the onset of Operation Rio Grande, Martinez said. 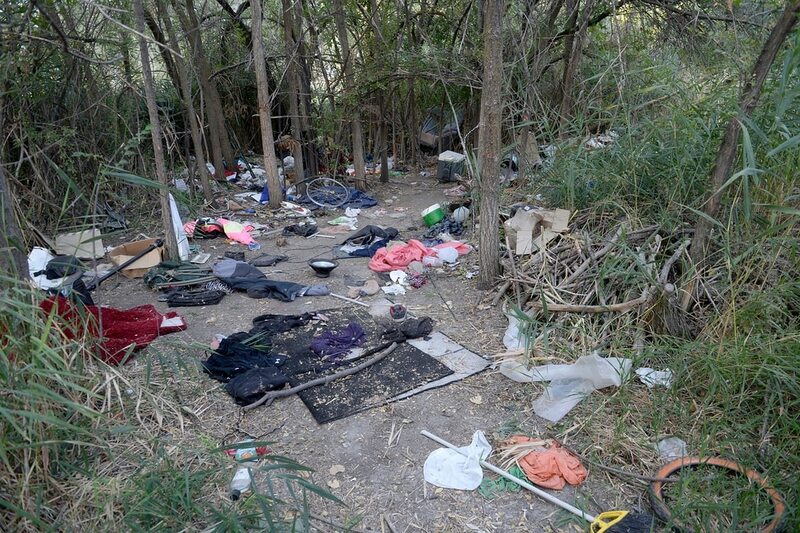 Homeless camps along the Jordan River are nothing new, but Martinez said that until recently few drug addicts lived there. How drug users, particularly heroin addicts, will get their fix outside Rio Grande remains to be seen. Drug traffickers may have to modify their behavior, too, seeking out addicts wherever they may be. It doesn’t bode well for neighborhoods.